For more than 30 years, Thorne Research has endeavored to enhance health and wellbeing by providing superior products formulated with the highest levels of purity and quality. Thorne’s daily regimen of personal care products are made from the finest certified organic essential oils, resins and botanicals obtained from renewable sources. All ingredients are selected for their matrix of complex antioxidants, nutrients and enzymes, which penetrate the deep layers of the skin and provide hydration and nourishment. Thorne Organics personal care products are formulated without the use of harsh and artificial ingredients, are void of hidden chemical substances and additives, and are non-GMO. Uplifting Citrus Shampoo, naturally balanced with plant extracts, contains 87% certified organic ingredients. Gentle enough for everyday use and safe for use on color treated hair. Also available in an unscented formula. Uplifting Citrus Conditioner, a highly concentrated, deep penetrating formula, nourishes hair and restores its natural beauty. Safe for use on color treated or brittle hair. Also available unscented. Uplifting Citrus Shower Gel contains a blend of rich organic botanicals of aloe, carrot, sunflower, olive and pure balsam to nourish and clean the skin. Naturally scented with orange, lemon, lime and bergamot fruit oils. Also available unscented. Manuka Therapy Cream protects the skin with the healing and nourishing properties of New Zealand Manuka Beeswax and Manuka oil. Ideal for rough, dry or difficult skin or use as a nighttime face cream. 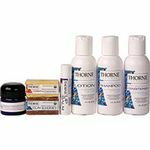 Thorne Organics Starter Kit contains travel sizes of top selling skin, hair and body care products specially formulated for sensitive skin. Includes unscented shampoo, conditioner and lotion, Lip Balm, Manuka Therapy Cream and 2 skin care bars. This entry was posted in Home and tagged Manuka Therapy Cream, Professional Supplement Center, Thorne Organics, Thorne Organics Starter Kit, Uplifting Citrus Conditioner, Uplifting Citrus Shampoo, Uplifting Citrus Shower Gel, Vitamins and supplements, www.professionalsupplementcenter.com. Bookmark the permalink.